NmPCB – completely waterproof & dustproof PCB board with nanometer technology, especially suitable for gaming users. CIY 2.0 – hot swappable switches, change it yourself, make customizing your favorite mechanical switches so easy. Since so many years, switches’ brands are always Cherry, then to these years, Gateron, kailh come into being. But they are all MX-based switches, typing feeling is not be improved much. Especially for gaming users, have no more better switches to choose, it is a little pity. Almost all of mini mechanical keyboard board are not waterproof & dustproof. MonkeyKing Custom team’s prime concern is providing the solution for it. For smart programmable RGB 60% keyboard, the price is always more expensive, most user can’t buy it. Optical switches with high reaction speed and durable, bring the typing experience to the ground-breaking high Level. It’s fitted with your choice of optical switches. This allows you to get the perfect tactile or linear feel to suit your typing style. Built your favorite optical mechanical switches by yourself. Trying out different optical switches, replacing old ones, and matching several types of mechanical keyboard switches used to be difficult and required extreme technical skill. Now PioneerMonkey series optical mechanical keyboards are designed to allow you to change your key switches without the hassle of soldering. This caters to anyone who uses their keyboard for multiple purposes. Switching from gaming to typing, for example, might require that you swap your Linear switches to Clicky ones. As long as you like, remap WASD to arrow keys, or re-assign IJKL to arrow keys…It’s a piece of cake. Recording some macros to keys in E-sport games, setting macro keys for gaming. Building gaming macros are the hallmark of a high-level gamer. You can set up any key to trigger a macro. The “MagicFinger”driver software makes it easy. FPS, MOBA, or even Minecraft… PioneerMonkey has it covered. PioneerMonkey keyboard with macros is a quite good mini mechanical gaming keyboard, can improve gamers’ performance effectively. Surpass competitors easily. For example, game players can define the RGB colors for WASD keys, strengthen the gaming experiences. When you press the keys you customized, The RGB color shining just as you liked, feel so cool. Immersed gaming backlighting effects are also can be customized via MonkeyKing custom mechanical keyboard community’s update driver software in the future. For example: Linked RGB LED effects with e-sport gaming, will strengthen the gaming experiences to gamers. A real awesome rgb mechanical gaming keyboard. Access up to stored profiles on the go, completely independent of external software. Take performance and lighting settings with you. Technology brings progress and benefits. Optical mechanical switch’s performance is better than MX-based switch’s, but the price is cheaper than MX-based switch’s. Portable, a mechanical keyboard on the go. Cheap price, more people can affordable 60% smart mechanical keyboard, use and play it. 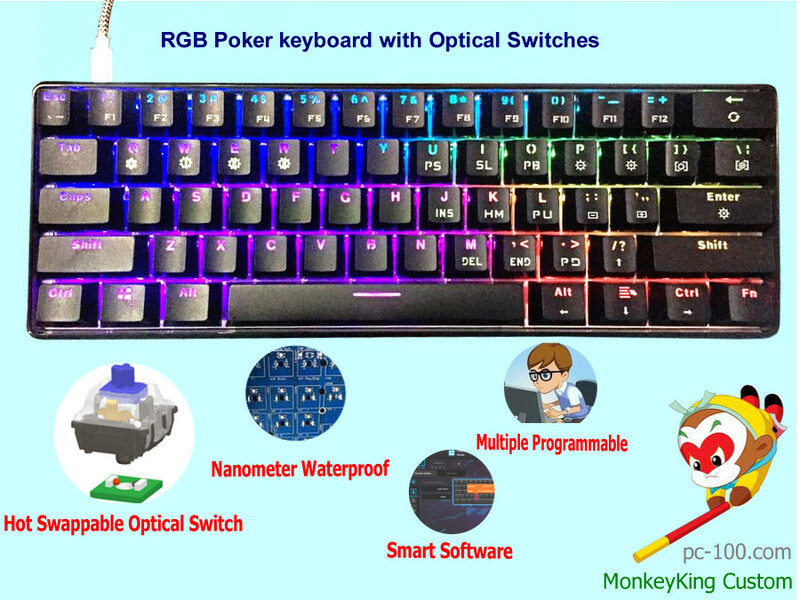 1.PioneerMonkey keyboard: hot swappable optical switches, waterproof & dustproof PCB board, full RGB backlit, multiple programmable with smart driver software, at best cheapest price in 2017. 2.PioneerMonky, with optical switches and waterproof & dustproof board, suitable for gaming, not only at home or in cybercafe, a perfect professional mini mechanical gaming keyboard for gaming users. 3.Pluggable mechanical keyboard, suitable for typing enthusiasts and gamers. 4.Optical switch is a new kind of mechanical switch, completely different from MX-based switch. PioneerMonkey keyboard is the first one to use it among 60% keyboards. So PioneerMonkey is especially for people who like to pursue new technology, like to try new technology. 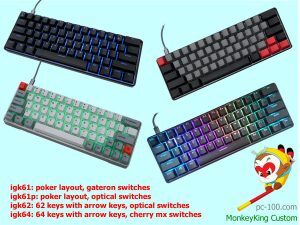 5.PioneerMonkey keyboard is the cheapest one among IngeniousMonkey series. No matter you come from US, UK, or you are from Australia, Asia…Only you like it, you can buy it easily. Monkey King is also a magic monkey. He has the ability of 72- changes. In any necessary occasions, he can change himself into what he want to be.